Four future scenarios of a healthier, more equitable and sustainable Europe in 2040. 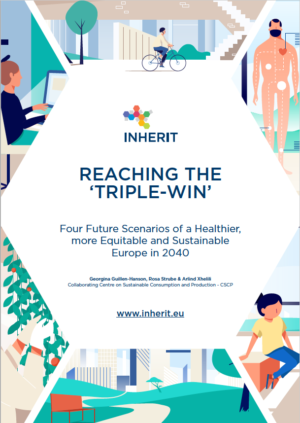 The INHERIT ‘Reaching the triple-win’ report portrays four future positive scenarios of healthier, more equitable and sustainable European societies in 2040. Diverging in social dynamics (collective versus individualistic) and driving sector (public versus private) the scenario narratives aim at inspiring strategic interventions, innovations and action plans as well as behaviour change for better future livelihoods. Digitalisation, connectivity and personalisation characterise ‘My life between realities’ while sufficiency, elevated self-awareness and mindfulness as well as less material ownership are the main principles of the ‘Less is more to me’ scenario. Following, ‘One for all, all for one’ is based on elevated locality, participatory decision making and communality, while ‘Our Circular Community’ thrives on (multi-stakeholder) co-creation, citizen sciences and circular economy. To read the full scenario narratives, find out more how we developed the scenarios as well as have a visual glimpse of life in 2040, download the report below and watch the scenario videos here.